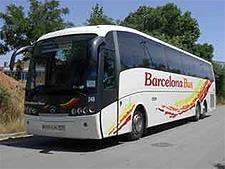 The Barcelona bus is probably the most convenient method of transfer between Girona Airport and Barcelona city centre. The bus stops in Estacio d'Autobuses Barcelona Nord. A return ticket costs 21 euros. From the Estació d'Autobuses Barcelona Nord, you can catch the metro underground. The nearest metro stop to the bus station is “Arc De Triomf” (Red Line, L1).